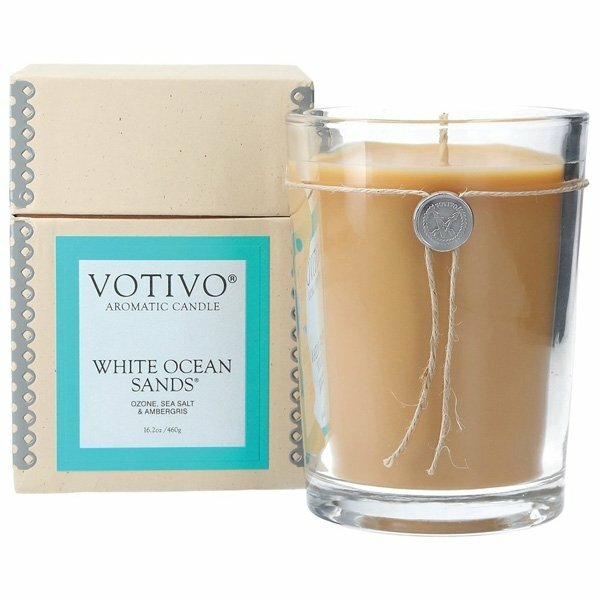 Votivo White Ocean Sands Candle: As the warm midsummer day drew to a close, the familiar sea salt freshness awaited their return… but this time was different; a smoke infused woodsy essence rose in gentle swirls from the beach side bonfire beckoning them to enjoy. Seashore. Ozone. Fruity Citrus. Sea Salt & Ambergris. Supersize your Votivo Aromatic Candle experience with the 16.2 oz Large Candle. Enjoy your favorite fragrance even longer with a burn time of up to 100-110 hours.